Adosi Serethi is a Dunmer ostler living in Aleswell. Her brother, Diram Serethi, runs the Aleswell Inn. Like the rest of the town's population, Ancotar's wild experiments down in Fort Caractacus have made her invisible and it's up to you to resolve the matter. She doesn't do much in her life and is found wandering around the inn all day and night, never even eating or sleeping. Due to her low disposition, she spends all of her time insulting both her brother as well as the rest of the town's population with the exception of her similarly-minded sister Urnsi Serethi. During the inn's busy hours between 6pm and 9pm, she can be heard rejecting everybody who tries to come in contact with her, much to the annoyance of Diram. She wears a pair of belted braies, a collared shirt, and a pair of sack cloth sandals. Her only other possession is a small amount of gold. Like the other citizens of Aleswell, Adosi is affected by a high-level Chameleon spell called "Ancotar's Invisibility." As she is hateful by nature, you can't get any polite words out of her and when first approached, she will guide you on to her brother with her usual bitter attitude: "Sometimes, people who are invisible are trying to get some privacy. Diram will be glad to talk your ear off about the whole mess." Upon successful completion of the related quest, she will be reserved about the whole deal and even act patronizing towards you: "Oh, it's you. My brother goes on and on about you. I know you saved us and everything, but it does get tiresome after a while." Should you happen to fail the quest, her only response is a warning: "You better stay away from Diram. He's not very happy with you." 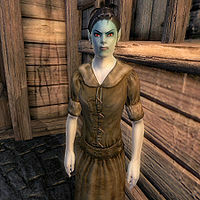 If you ask her about Ancotar, she will say to you, "Typical Altmer. Thinks the whole world is made for his convenience. If I had my way, we'd go down there and burn him out. Let him find some other place for his little "experiments."" Diram, who isn't particularly impressed with his sisters' attitude towards everybody else, will, after the quest is finished, make a bittersweet joke: "My sisters, on the other hand ... I wouldn't mind if they had stayed invisible! Ha ha ha!" This page was last modified on 2 November 2016, at 23:40.